It’s a dark, wet, gloomy morning here in the mitten. There is no doubt that fall is upon us. The leaves are beginning to change, my garden is (finally! dying, and huge flocks of thousands of birds have been occasionally sweeping through our tree tops. All this fall-ness makes me want to cook squash. 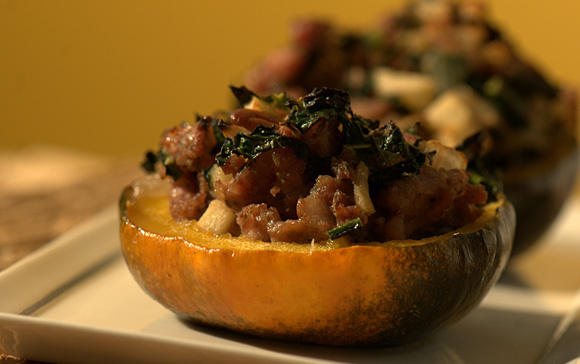 Last night I put together a delicious stuffed squash dish that I thought I’d share. Not only is this a complete meal in itself, but the whole dish only took me a little over a half hour from start to finish. I think I’ll be making variations on this a lot this fall. If you don’t microwave, you could bake the squash, face down, on a foil-lined baking sheet for 30 minutes before stuffing it and returning it to the oven. Slice the squash lengthwise and scoop out the seeds. Place the squash in a microwave-safe dish, cover, and microwave for 10 minutes. Meanwhile, cook the sausage (remove from casing if necessary over medium-high heat until about halfway cooked through. Add the onion and continue cooking for about 5 more minutes. When the sausage is nearly done, add the apple and kale. In a large bowl, beat the egg with the milk. Add the pecans and the sausage mixture. Place the microwaved squash, hollow-side-up, on a foil-lined baking sheet. Fill each squash with the stuffing and bake at 400 degrees for 20 minutes. Why the milk in this recipe? Hi Dave – The milk adds a little moisture so the stuffing doesn’t dry out so much in the oven. You could leave it out or substitute broth or even a little water. I don’t know about you, but I’m in southeast MI, and it IS incredibly nasty today. this recipe looks amazing though, perfect for a rainy fall day (and i ALMOST bought some sausage today too. oh well, next time!). I love this recipe, too. I like to add dried cranberries. How would I cook the squash in the oven? I don’t believe in microwaving my food at all. Hi Sharon, You can bake the squash for a half hour, face down, on an oiled/greased baking sheet or piece of foil at 400 degrees. Remove the squash from the oven, stuff, and then return to the oven (face-up this time of course) for 20 more minutes. Hope you like it! I just found your site and really love the layout. As a primal eater myself I appreciate finding new and innovative recipes. I really like squash and will certainly be trying this recipe. Your experience is similar to mine in terms of diet experimentation. Thanks for finding time to spread the primal message while raising two young children. I will be coming back soon! Sorry “Shelley”. I teach children, but am still learning how to READ! I literally just finished eating this for supper (and we had your apple popovers for breakfast too). It was delicious and I can’t wait to make it again… maybe even have some friends over to introduce them to eating primally! Keep up the great work. Can’t wait for your cookbook. Had to try this one, I love squash. added chopped garlic, mushrooms and basil to mine. I’m really going to have to stop snooping around here. This stuff looks wicked good. I love your blog and your recipes! I’m all for nuking winter squash — the microwave and SousVide Supreme are two appliances that let me cook my family gets a proper, home cooked meal during the work week! Keep up the good work! WOW! That was fantastic! When does your cookbook come out?? Thanks so much for posting recipes. I am new to paleo and need all the help I can get! I made these a few days ago and they were simply smashing! Lovely recipe, one of my new favs. I’ll be doing a post on them and sending folks over to check you out. My husband and I have made this twice…the first time I used spinach instead of kale. Both times it was fabulous! Thank you so much for helping us find flavorful meals that are primal too! I just made this, and it was FANTASTIC! The filling was enough for an additional squash – will save it for later in the week. Mmm… this is good. Making it for the second time tonight. This time I’m going to make it into more of a casserole, so I don’t have to worry about the squash/sausage ratio being exactly right, and because eating the squash out of the skin was kind of a pain. I used frozen mustard greens instead of kale, and walnuts instead of pecans. This is my new favorite. I added a little blue cheese on top and it is heaven. Hi – do you have a recommendation on brand or kind of sausage? so many I find have fillers or other non-paleo things. I want it to be organice, grass-fed. I made this yesterday and it was absolutely delicious! A little goes a long way too!